Leading Manufacturer of industrial shed from New Delhi. Leveraging on wide expertise, we are instrumental in developing highly reliable Industrial Shed. 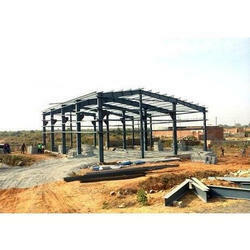 We are procuring the robust grade steel material to develop these pre-fabricated industrial sheds. Owing to our production efficiency we are designing a much-anticipated range of sheds featuring H-section, C-section, and U-section steel components, roof and walls. Further, the offered sheds are easy to install and provide assurance of superior environmental protection with its energy efficiency. Our prestigious clients can avail the quality compliant sheds from us at a leading price. Looking for Industrial Shed ?